In search of a homemade gift from my kiddos, I saw a few variations on Pinterest of this idea, mostly using footprints. They were super cute, but I didn’t want to invest in a large canvas big enough for feet. Instead I used an 8×10 canvas panel that I purchased on Amazon in a 12 pack (around a dollar a piece). I outlined the circle for my oldest kiddo and he painted the sun. 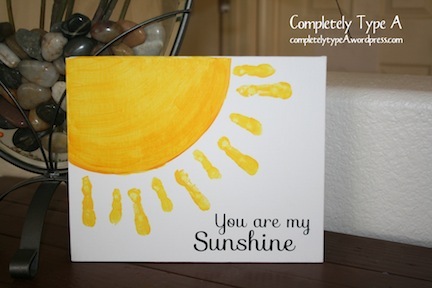 Then I helped each munchkin make three or four fingerprints on the canvas. Using my trusty Silhouette I cut out the letters in vinyl and applied to the canvas. I love how it turned out! On the back (not pictured) I put “Made with Love and Little Fingers” and had all my kids sign their names.